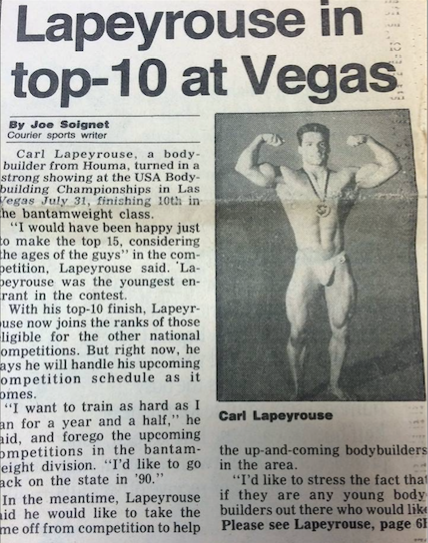 Carl J. Lapeyrouse, born 52 years ago in Houma, Louisiana, south of New Orleans, has been involved in the health and fitness field since 1985. He has always had a great interest in the human machine as well as being physically active since he could remember. As a child, Carl had numerous food allergies and a weak immune system. He was always sick with a sore throat, the flu, bronchitis and pneumonia. He started working out in his teens and dreamed of being like the men in the bodybuilding magazines. He could never really stick with any program because just as he would begin to see improvement, he would get sick. Finally, at the age of 18, Carl decided it was time to take a look at the total picture. Up until that point, he had concentrated solely on exercise. Carl slowly began to include the principles of proper nutrition and a positive attitude into his lifestyle. It was an education as well as an evolution and it certainly didn't happen overnight. Eventually, he became one of the men in those magazines in addition to appearing on ESPN. In 1989, Carl was hired by a weight loss corporation as a nutritional counselor, conducting seminars under the advisement of physicians. He was soon valued not only for his knowledge of nutrition and it's real-life applications, but also for his ability to motivate people in achieving a healthier lifestyle. ​Today, Carl owns that very corporation with 2 clinics in Louisiana. The Fat Kills, Learn the Painful Truth about Weight Loss program is a product not only of Carl Lapeyrouse's lifestyle evolution, but also of the exciting new directions he has taken at our clinics helping thousands of successful patients improve their health, their appearance and their lives. There is no magic potion or pill. The magic is in believing in yourself. "There's not an able-minded, able-bodied person in this world who cannot lose weight."